I suppose like most photographers something will occasionally catch your eye allowing you to stop, pause for a moment and analyze what it is you are seeing that totally intrigued you. The temperature at daybreak hovered near zero degrees Fahrenheit. Overnight ice crystals formed on an outside door. As I went outside to fill up the bird feeders this morning light caught this panel of crystals just right. After tending to the winged-ones, I came back to examine this beautiful piece of frigid art for a minute or two viewing it from various angles. It was worthy of the pause in the daily routine. 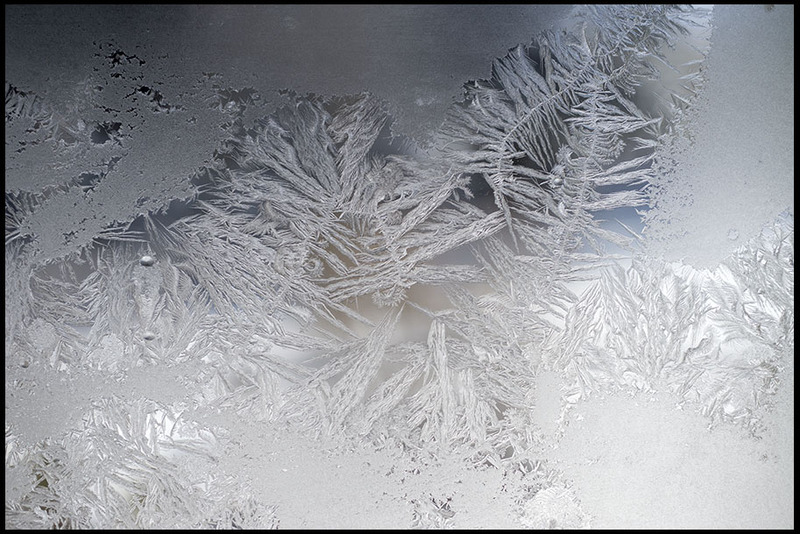 On further review: Curious about the formation of ice crystals I did some further reading. The theory by scientist H.K. Weickmann intrigued me.